Designers nationwide are seeing a general trend toward smaller residential spaces, with some saying that only a quarter of their clients want the large, elaborate spaces that have been so popular in recent years. Many factors, from eco-consciousness to decreased maintenance, enter into the decision to live small, as designers guide their clients through the transition to a smaller living space, See-through modular furniture—open-backed barstools, the raised glass bar top, a linear cocktail table and seating on legs with exposed space below—is easy to rearrange and compliments the openness of this compact kitchen/ living room combination. Mirrors above the custom storage cabinets on either side of the fireplace reflect natural light from three windows on the opposite side of the room, visually expanding the space. Jamie Gibbs, Allied Member ASID, IFDA, WCAA, RLA, of Jamie Gibbs and Associates in New York City, observes that his clients’ smaller space preferences vary by age. People ages 25 to 35 often want easy-to-maintain, cost-effective 850- to 1,600-square-foot “turn-key” spaces because their jobs require long hours and much out-of-town travel. Having a small home is not inconvenient since they often stay in hotel rooms or suite hotels. They use their homes largely to receive mail, store possessions and house entertainment centers. “They aren’t at an age where they are ‘collecting’ yet and, for the most part, they aren’t buying furniture for the long run,” notes Gibbs. More emphasis on providing common space for the whole family is characteristic of 35- to 55-year-olds, with less interest in the large mastersuites and specialty rooms that increased residential square footage in the recent past, Gibbs believes. Because these families have casual lifestyles, the need for formal living rooms and dining rooms have diminished. 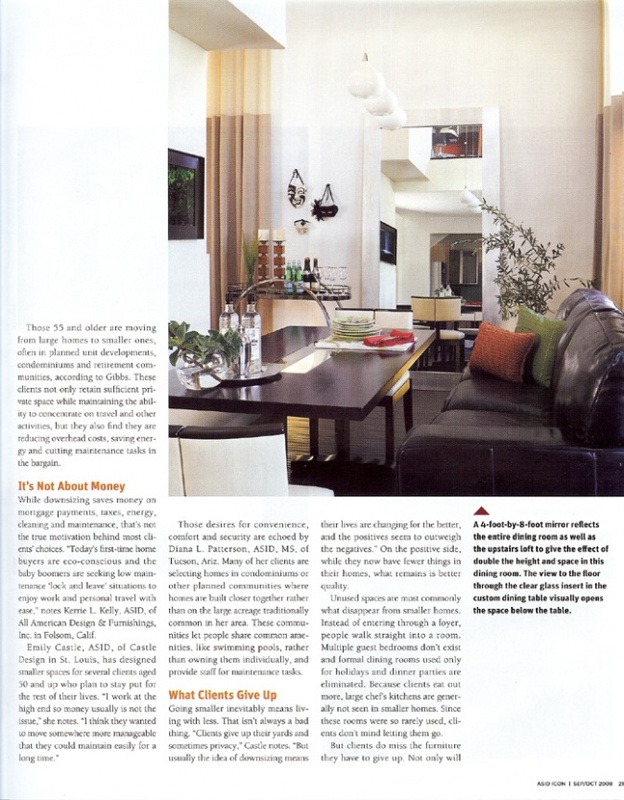 “Great rooms, hearth rooms and open-concept family rooms with kitchens and dining areas are the norm,” he says. For these clients, about 2,500 square feet is typical compared to the once-popular 4,000-plus-square-foot dwellings. Those desires for convenience, comfort and security are echoed by Diana L. Patterson, ASID, MS, of Tucson, Ariz. Many of her clients are selecting homes in condominiums or other planned communities where homes are built closer together rather than on the large acreage traditionally common in her area. These communities let people share common amenities, like swimming pools, rather than owning them individually, and provide staff for maintenance tasks. What Clients Give Up Going smaller inevitably means living with less. That isn’t always a bad thing. “Clients give up their yards and sometimes privacy,” Castle notes. “But usually the idea of downsizing means their lives are changing for the better, and the positives seem to outweigh the negatives.” On the positive side, while they now have fewer things in their homes, what remains is better quality. Unused spaces are most commonly what disappear from smaller homes. Instead of entering through a foyer, people walk straight into a room. Multiple guest bedrooms don’t exist and formal dining rooms used only for holidays and dinner parties are eliminated. Because clients eat out more, large chefs kitchens are generally not seen in smaller homes. Since these rooms were so rarely used, cli-ents don’t mind letting them go. But clients do miss the furniture they have to give up. Not only will A 4-foot-by-8-foot mirror reflects the entire dining room as well as the upstairs loft to give the effect of double the height and space in this dining room. The view to the floor through the clear glass insert in the custom dining table visually opens the space below the table. Smaller Furniture and Fixtures for Smaller Spaces Manufacturers have responded to the smaller home trend by mak-ing appropriately sized furniture. Restoration Hardware, Industry Partner of ASID, now offers apartment-size sofas or loveseats in all of its core lines. These smaller seating pieces range from 73 to 80 inches wide compared to 85 to 93 inches for its conventional sofas. Smaller dining tables measure 72 inches long, while their full-size counterparts are 90 to 92 inches; round dining tables may be an ideal choice for small spaces, as they are only 54 inches in diameter but can be expanded to 72 inches with leaves as needed. Even smaller outdoor spaces, such as apartment balconies, are well served by reduced-size items such as Restoration Hardware’s La Jolla line of outdoor furniture. Spaces like bathrooms can be just as luxurious as their larger counterparts with smaller and multi-purpose pieces, such as Nep-tune’s corner bathtubs and showers (see photo top right) with clear doors all around, that make small bathrooms seem larger. Sonia’s wheeled Bath Trolley (see at right) is a portable small vanity for toiletries, fitting under a sink or other location. Even more multi-purpose is Julien’s Benchtoilet (see page 16) that combines a toilet, bench seating and storage—a sliding wooden panel covers the toilet when not in use. 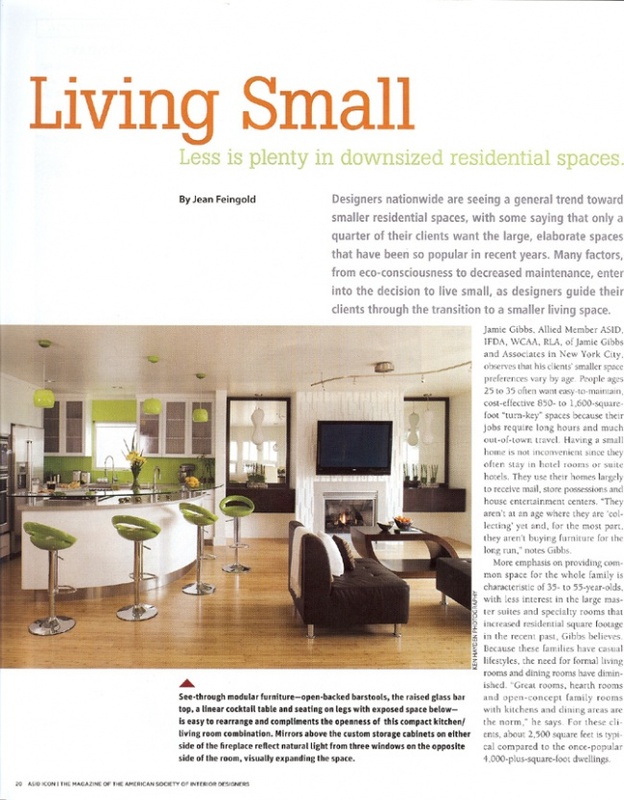 Designing for Smaller Homes In smaller residences, designers must “make every square inch count through color, pattern, division of space, furniture and storage,” Kelly says. “When these elements are put together appropriately, it is evident that space-challenged rooms reflect not only function and efficiency, but also charm and intimacy.” This goal is achieved by creating multipurpose spaces and using multifunction furniture. Patterson notes that designers must ignore floor plan labels and design the space to meet clients’ specific needs. The basics are places to relax, eat, sit and visit with friends, a comfortable master bedroom with a big bath, a home office space and a guest room. “You can do all of this in about five rooms,” she notes, often through combining spaces such as an office and guest room or creating a living room/dining room in one space. For example, one of Patterson’s clients had a 15- by 30-foot “living room.” By putting a chandelier in the middle, Patterson created a dining area. The living space was located at one end, using a sofa table behind the sofa to divide the living space from the dining room. The room’s other end became a home office with a screen partially blocking the desk from view. A second home office hosts a sofa bed for guests. Communicating these often-creative space considerations to clients is of utmost importance. “I provide my clients with a floor plan of their new space showing a combination of new and existing furnishings,” Castle says. “This acts as a road map for what will fit and the clearances. I only suggest relocating existing furnishings that are the correct scale, and we fill in after that.” Castle uses a dominant piece of furniture or art as a focal point and leaves plenty of open space so that even small rooms do not appear crowded. And she employs the use of outdoor balconies and terraces when available to provide more liv-ing space. To maximize the flexibility required of a smaller space, furniture can become mobile and adaptable by adding casters on the bottom or a leather handle to the back or sides. Dining chairs can do double duty as desk chairs, for instance, with ottomans or cubes used both as seating and side tables: A desk used for writing and to display family photos can serve as a dining room buffet and modern Murphy beds let daytime living rooms become overnight bedrooms. Laptop computers often take the place of larger desktop units and can be used throughout the home with the addition of a wireless connection. Some sofa tables open up to become dining tables, serving as lamp tables or buffets when closed; side cabinet sections of a media wall unit can store linens and china; and a trunk at the foot of a bed can also handle linen storage. Small Is Greener Environmental concerns fit well with the trend toward smaller living spaces. “When you have a smaller space, you’re using [fewer) resources all around, from the design elements to the building itself,” says Lori Dennis, ASID, LEED AP, of Dennis Design Group in Los Angeles. “Less is good in green.” To live in a small, green home, clients “have to learn how to do without so much space,” Dennis says. “It’s easier and cheaper to maintain, furnish and clean. A lot of times, they’re giving up nothing because they have space they don’t use. We find that when people downsize who have a whole lot of stuff, it’s liberating.” It is likely that smaller living spaces will become the norm as people seek simpler lives and adapt to lifestyle and demographic changes. Interior designers must modify their thinking to go with this client trend. Still, “no matter what the size of your space, living gracefully is the ultimate goal,” Kelly says. When well designed, smaller may, in fact, be better. Jean Feingold is a Gainesville, Fla.-based freelance writer who often writes about design and construction-related topics.